Readings has announced the shortlist for its 2018 New Australian Fiction Award. The Lucky Galah (Tracey Sorensen, Picador). This year’s judges are Readings Carlton bookseller Deborah Crabtree, marketing and events coordinator Ellen Cregan, human resources manager Jan Lockwood and Readings Hawthorn bookseller Mark Luffman. Readings managing director Mark Rubbo and author Tony Birch will join the panel to select the winner. 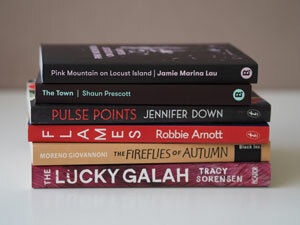 The award, now in its fifth year, recognises ‘exciting and exceptional new contributions to local literature’ and is open to ‘first or second published works of fiction by Australian authors’. Previous winners are Sam Carmody’s The Windy Season (A&U), Zoë Morrison’s Music and Freedom (Vintage), Stephanie Bishop’s The Other Side of the World (Hachette) and Ceridwen Dovey’s Only the Animals (Penguin). The winner of the $3000 award will be announced in late October. For more information, click here.